A great option for life and recreation. Pleasant location in the foothills in Bahceli, surrounded by the untouched nature of North Cyprus. 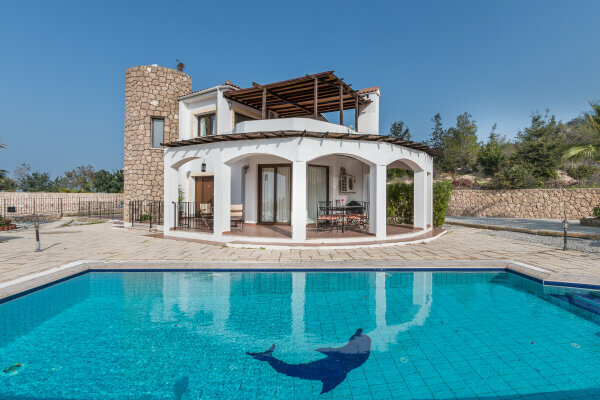 This villa offers amazing panoramic views of the mountains and the sea. The layout is convenient for any type of family – three bedrooms, three bathrooms, a spacious living room. A huge terrace on each floor. Swimming pool and patio with barbecue area. Parking lot can fit up to three cars. A nice villa in the Mediterranean style. Good quality of construction, comfortable layout. Large living room, spacious terraces on each floor, patio, barbecue area, large swimming pool. In this house there is everything you need for a wonderful time of spending. You can also enjoy the beautiful nature of the mountains and the sea. The place is quiet, but very close to the one of the most important highways of the island. The complex is also located half an hour's drive from Kyrenia, the most developed city of Northern Cyprus.